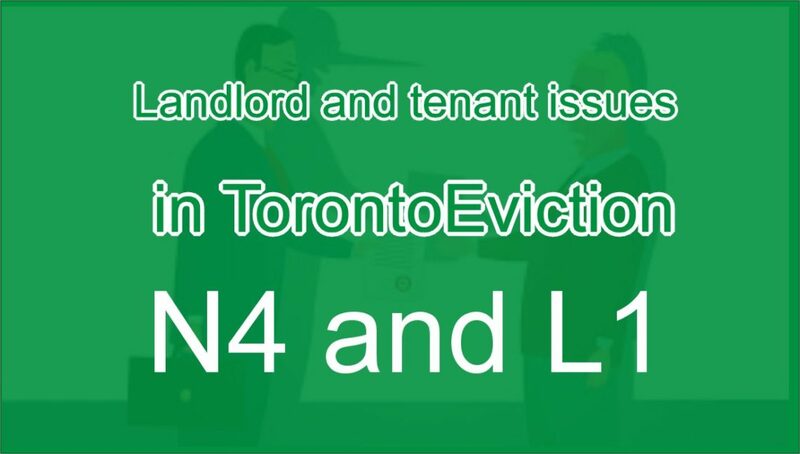 Landlord and Tenant Board in Ontario/ N4 Notice -L1 application; Eviction for non- payment of rent. The Landlords in Ontario having problems with tenants with nonpayment of rent shall initiate their legal action by filing and serving the proper Notice, N4. Landlords must be very careful while filling out the form. Most errors while filling out the n4 Notice could lead to dismissal of the landlords’ application. In most situations, if the errors were made in filling out the application, L1, can be amended. Should the application get dismissed by the Board, the Landlord had to restart the entire process. This means filling out N4 Notice and servicing by the correct method and filling the appropriate application to have a new hearing date. Getting a new hearing date is a very lengthy process. In addition to properly filing the N4, serving the N4, filling L1 application; the landlord had to know the procedures involved in presenting the case before the member for success. His Master’s Legal Services offers landlords with “start to finish” a complete full retainer in this N4/L1 process.